Established in 1960 in a place known as ‘Crès Ricards’ in the municipality of Ceyras (32 km from the coast), the estate sits at the foot of Mont-Baudile, in the foothills of the Larzacplateau and the Massif Central. The free draining, mineral-rich soils full of pebbles carried down by the River Lergue offer exactly the same conditions as some of the famous Southern French grand cru appellations. 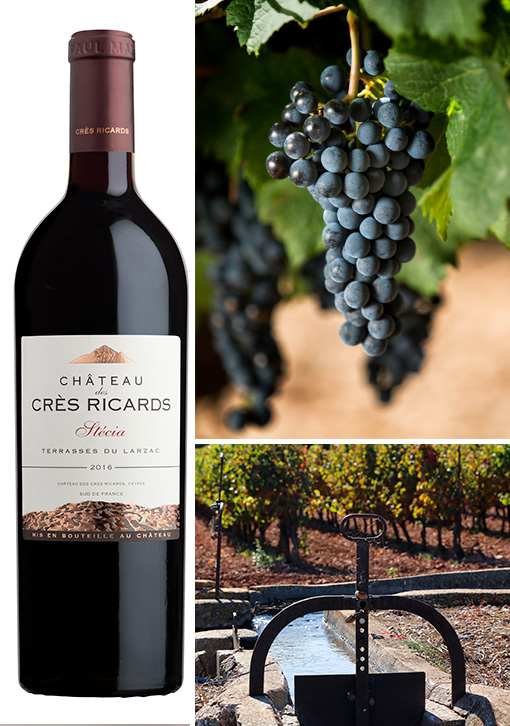 In 2010, Jean-Claude Mas acquired the 27 ha belonging to the Château, extending the estate to 42 ha in 2013. The well drained clay-limestone soils are composed of round pebbles, red soil and shale. Rich in micro-nutrients, the soils provide the vines with the best possible conditions for a slow ripening period, producing wines that have a wonderful balance both in structure and aroma. The vines are planted to a density of 5200 vines per hectare and yield 40 hl/ha. Hand harvesting allows very careful grape selection whilst partial carbonic maceration produces generous wines. 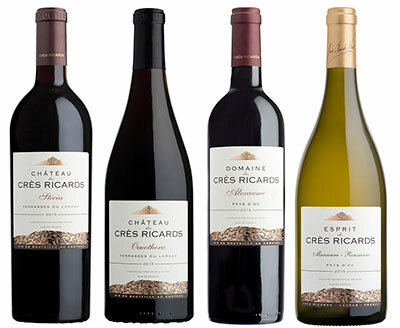 The Domaine produces our Château Crès Ricards Oenothera, Stecia and Alexaume from Syrah, Grenache, Mourvedre, Cabernet Sauvignon, Merlot, Carignan, Cinsault and Alicante vines which are sustainably grown and certified Terra Vitis. The Cordon de Royat pruning method is used. The wines are produced and aged in small cement or stainless steel vats and French and American oak barrels. Situated to the north west of Montpellier, the Terrasses du Larzac vineyards are heavily influenced by the cool air from the high Larzac plateau, symbolized by Mount Baudile which peaks at 850m (2800ft). Geographically, it is pretty unique, with day/night temperature variations occasionally as wide as 20°C (68°F) in summer. This means the grapes mature slowly and steadily, resulting in the wines’ freshness and aromatic complexity.